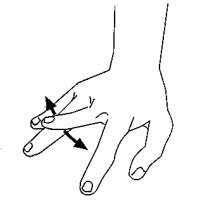 Pitres Testut sign is a used for examination of ulnar nerve palsy cases. Pitres Testut sign is defined as the inability to actively move the middle finger in radial or ulnar direction / abduct to either side with the palm faced flat on the table.It is used to clinically examine ulnar nerve. It is also called the Dancing Middle Finger Test. Pitres testut sign or the dancing middle finger test.